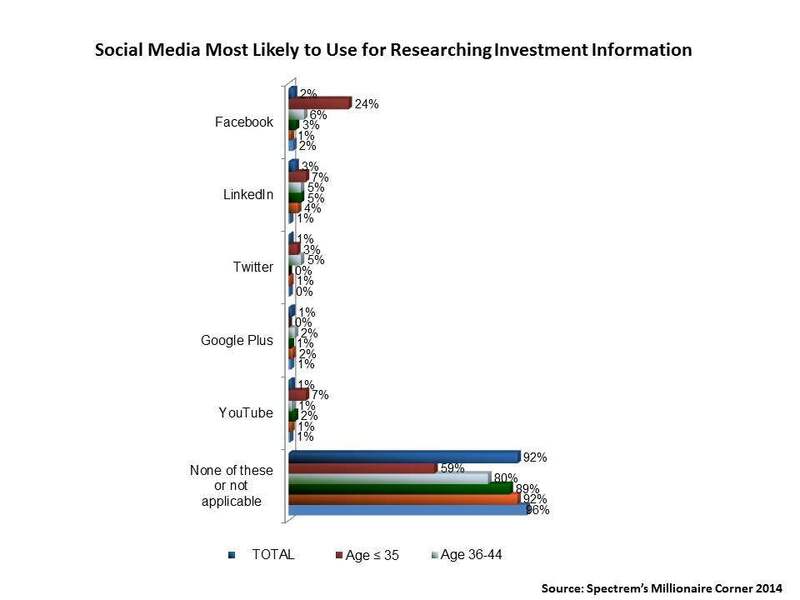 Millionaire users of social media do not seem ready to embrace it as a resource for financial purposes, but wealthy Baby Boomers are most likely to see the possibilities, according to a new Spectrem Group’s wealth level study of social media usage. Overall, only two percent of Millionaire investors with a net worth up to $5 million (Not Including Primary Residence) said they would use Facebook for researching investment information. But among these, nearly a quarter of respondents who are ages 55-64 (24 percent) said they would use Facebook for such a purpose. Similarly, 3 percent of Millionaires surveyed said they would use LinkedIn to research investment information and among these, the highest percentage of those who said they would (7 percent) were Baby Boomers. Seven times as many Millionaire Baby Boomers (7 percent) also said they would use YouTube for this purpose. Millionaire Baby Boomers are most likely, too, to use Facebook or LinkedIn (10 percent each vs. 1 percent and 5 percent overall, respectively) to find a financial or investment advisor. Seven percent would also use Google Plus for this purpose compared with a mere 1 percent of Millionaires surveyed. The immediacy of Facebook and Twitter also lend themselves as platforms for obtaining market updates, said 14 percent of Millionaire Baby Boomers, compared with up to just 2 percent of Millionaires overall.